Training 1% of the population is just one part of Finland’s push for AI. The business world and public sector are also fully leaning in. Recently a story on Finland’s plan to train 1% of its population in Artificial Intelligence has been making the rounds. Starting as a private initiative jointly promoted by the University of Helsinki and the consulting firm Reaktor, an open, free online course, “Elements of AI” was made available to anyone who would be interested in understanding the basics of AI. The initiative was then embraced by the government and has been integrated into a national AI strategy. But this is just a part of the Nordic country’s ambition for the so-called “data economy”. Outi Keski-Äijö, the Head of AI Business program at Business Finland, outlined for Telecoms.com the major steps the agency and other institutions have taken as well as their the near-term plans. Her public sector agency is tasked to both support enterprises inside Finland and promote Finnish business interest outside of the country. Over the past two years, the AI-focused team she leads has been working with start-ups and small and medium sized enterprises (SMEs), to drive innovation through funding as well as helping bridge them with business implementation. On the funding side, Business Finland would invest up to €50,000 in promising projects that are focused on solving concrete problems. Finland’s total public-sector funding over a four-year period will be no less than €20 million, including €6 million in the first year. Business Finland is responsible for over half of the total budget. When it comes to connecting innovations from start-ups and SMEs to implementation, many innovations have found their way to both the emerging sectors like smart transport management, and traditional industries like ship-building. The innovations in AI have also attracted international attention, hence the success of the second part of the agency’s mission. Companies in Asia and North America have already shown interest in taking on board some of the new output. When asked how Finns see privacy protection vs. progress in AI, Keski-Äijö and her team introduced us to the work done by one of its sister organisations, the Finnish Innovation Fund (Suomen itsenäisyyden juhlarahasto, Sitra). Sitra is an independent fund overseen directly by the Finnish Parliament. One of its key programs now is to develop the principles, framework, and key components of what it calls “Fair Data Economy”, under the brand IHAN (Ihmislähtöinen datatalous-avainaluetta, literally means “people-centric data economy”). With GDPR in place, theoretically consumers now have control over their data and can demand to know how their data is being stored and used by any companies. In practice however, it is hardly possible for an individual to chase every single service she uses. Also, as Sitra put it, “GDPR does not define the format, governance or method for consent-based personal data sharing.” As a result a consumer’s data is being managed and analysed in silos, and services provided to her are not necessarily optimised. What IHAN aims to achieve is to provide a stamp of approval. Services certified by IHAN would be trustworthy for consumers to handle their private data. 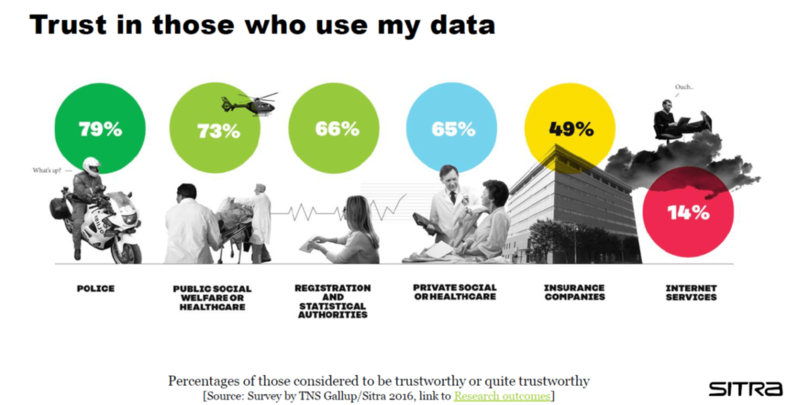 When enough services are certified the data shared between them will be able to deliver personalisation without comprising privacy. Here Finland’s big ambition kicks in. Sitra is looking to use IHAN as a model to drive EU-wide AI and data economy to a more competitive level. With Finland taking over the EU presidency in the second half of 2019, Sitra is set to promote IHAN more vocally beyond the Finnish borders. There is nothing wrong with the thinking, but Sitra may find the idea not going down as well in other European countries. The anchor point of the IHAN concept is trust. The Finns, rightly or wrongly, put very high level of trust in the public and social institutions. For example, according to a poll done by TNS Gallup for Sitra in 2016, nearly 80% of Finns trust the police, two-thirds trust in the registration and statistical authorities, but only 14% trust the internet companies. The low level of trust in the internet companies may be indicative broadly across many countries, the high level of trust in the authorities may not.